Now it is a growing destination for people that not only want to enjoy sun and beach but have a taste of unspoiled nature and culture too. Most of its kilometric beaches are still rather natural, reasonably uncorrupted, not extremely massified and with hardly any concrete skylines that damage the beautiful natural environments and the views. On the Costa de la Luz you are reminded that beaches are actually a part of nature and not some kind of extension of an urban agglomeration. And you can still taste the authentic andalusian atmosphere in its many small and pitoresque towns. Sanlucar de Barrameda has 7 km. of beaches of exceptional quality surrounded by pine forests, marshes and fertile countryside. Furthermore its a place overflowing with history and tradition, like the production of its exclusive Manzanilla variety of the world famous Sherry wines, or the horse races on the beach. Its location at the estuary of the Guadalquivir river and the only port of access to the National Park of Doñana makes Sanlucar one of the most privileged places on the Costa de la Luz. Chipiona's lighthouse on the Punta del Perro is the highest in Spain and third highest worldwide. It welcomes visitors and offers a relief to mariners. The name Chipiona comes in fact from the lighthouse, as the Romans gave the name “Turris Caepionis” to its first basic construction. The cute small town, which was a rural and seafaring spa in the 19th century, is one of the most popular resorts on the Costa de la Luz for today’s visitors offering some 12 km. of splendid beaches. El Puerto on the Costa de la Luz is located on a section of the Atlantic coast where the pinewoods, growing among marshes, reach right down to the sand of the beach. It's an ideal destination to enjoy the sun, the sea, outdoor sports and good food. The beach of Cádiz is very large, nice and well kept. It offers the possibility to choose between the more popular part next to the city itself or the more quiet part just outside the boundaries of the city limits. In Conil you can find 14 kms of very varied beaches: from long sandy spots to lonely coves very appropriate for the nudism. Fine and golden sand and transparent and crystalline water. Ideal for the practice of nautical sports. 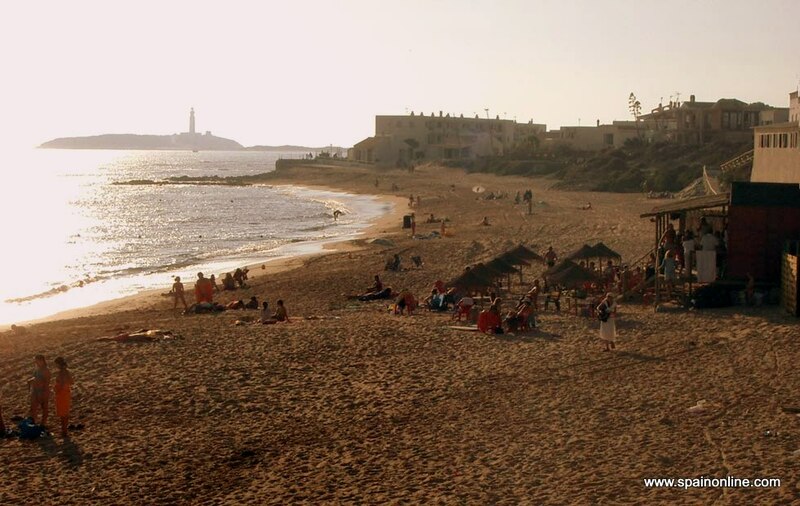 The beaches of los Caños de Meca are an example of the natural and savage beauty of Cadiz. Kilometric beach where you can enjoy a great tranquillity only altered by the wind of the zone, ideal to practice the Wind-Surf and Kite-Surf. Zahara de los Atunes is another of the marvelous and relatively virginal beaches of Cádiz. Bolonia is a beach that has very little construction done, but the ruins of Baelo Claudia show that the romans already liked this place. The southern-most city of Europe offers 38 km of golden and fine sand beaches, and transparent waters, ideal forwindsurfing and kitesurfing.